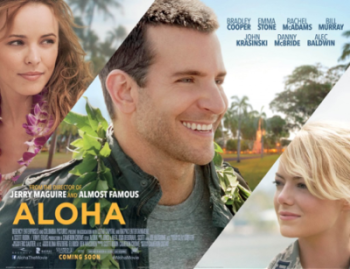 Aloha has a star studded line up: Bradley Cooper, Rachel McAdams, Emma Stone, Alec Baldwin even Bill Murray. It’s guaranteed to be the perfect rom-com action comedy (y’know good guy gets the girl, saves the world) and it’s set in Hawaii! What could go wrong? Well, pretty much everything. The plot runs along like a derailed toy train as Brian Gilchrist (Cooper) an ex-defence force worker returns to Hawaii to supposedly oversee the blessing of a gate. His old flame Tracy Woodside (Rachel McAdams) is now married and has two kids but old feelings begin to stir once the pair set eyes on each other at the airstrip. However, Gilchrist is given a watchdog Allison Ng (Emma Stone) who is a career driven pilot and is a quarter Hawaii (this is emphasized repeatedly to the point of shimmering superficiality) and together they save the skies from a dangerous nuke taking over that is orchestrated by the Machiavellian Carson Welch (Bill Murray). The plot is, simply put, a farce. It utterly misuses the landscape and people of Hawaii as a mere backdrop for an empty narrative that is wholly American-centric. The indigenous peoples of Hawaii are personified as exotica whose understandings of land and the sacred is mocked by Cooper’s narcissistic and insular perceptions. Sure he does his best at bargaining to return to the people what they rightfully owned over a 1000 years ago in return for allowing a gate to be built (let’s be clear these mountains were stolen from them, hallo colonialism) and he does stop the world from falling into the hands of evil nuclear masterminds – but it’s more because he has the hots for a young woman whose caught his fancy than from any real understanding of the locals’ ontology. If the film had any promise it was at the beginning but its clunky segues, the fact that 40-something Cooper chooses somebody who is young enough to be his daughter (slightly unsettling) and erratic structure is quite bewildering. More disappointing is how Stone’s character transforms from the hard hitting if somewhat overly enthusiastic independent woman to the puddle of mush that is a woman in love with Cooper who turns to her when he discovers that former love McAdams will (despite her problems with her silent partner) return to the healthier option of her current husband. Alec Baldwin also plays a role in this rather visual mess and probably so close to how he is in ‘real’ life that this reel performance doesn’t show much acting. Murray is the bored, sophisticated and unshaved villain and his demise is comic – if nothing much else. Cooper plays a crippled ex-military worker and if there’s any singular recurring theme it’s the fact that as a whole the film is utterly disabled. Not just in bastardizing and capitalising on the word ‘Aloha’ and creating a highly offensive portrayal of Hawaiian people but the fact that none of the plot elements make any sense. Cameron Crowe has had some memorable success in the past but this film is more about convention and convenience. It uses a bunch of pretty faces and a weak storyline and in the end it’s doubtful whether any audience will embrace Aloha for more than its cast of well-known American actors.